Many years ago, when I used to work in Kolkata, I used to commute regularly between Howrah and Kharagpur. The drill was something like this. After reaching Howrah station and buying my ticket, I walked down to the extreme left end of the station. By then a large crowd has already assembled at a strategic location from where one can see the electronic display as well as reach any of the potential platforms where the train is expected to arrive which is almost impossible to predict. Suddenly the huge crowd starts moving in a massive frenzy. This usually means that the electronic board has displayed the desired information. Travelling light is extremely important, since in that tsunami, it is extremely important that you do not disturb the stream line motion. A huge luggage, or a slow moving elderly can create a massive turbulence. And then when the train arrived, one needs to prepare himself for the next battle – to get onboard and then to get a seat. But after a gap of almost 25 years, those horrific memories were slowly fading away. Since those days, whenever I went to Kharagpur from Kolkata, it was either on an express train with reserved seats or by road. But this time, I thought why not venture the local train once again. After all, things must have improved in all these years. We hear so much about India’s growth and prosperity and of the wonderful work done by our Railway Ministers like Lallu Prasad Yadav, the management wizard or Mamata Banerjee, the wizard of change. My first surprise was at the ticket counter. First of all there was hardly any line which I attributed to the fact that it was quite early in the morning for casual passengers who purchase one way tickets. But the train fare from Howrah to Kharagpur was a shocker. It was only nineteen (19) rupees. I couldn’t believe myself. During the last 25 years, most things in India has appreciated almost 4 time (if not more), but the train fare (second class local) has hardly moved. I congratulated the ministers for making this possible and keeping the general commuters happy. I started to walk towards the extreme left strategic location. As I walked I found several changes around the station. Comfortable seating areas for the passengers and huge electronic display boards were something which did not exist in the late eighties. However I could not find my train anywhere in the list. I figured it would be useless to wait in front of the central display board since by the time the train is displayed, it will be too late for me to reach the platform and get myself a place to sit. So I followed my instinct and moved towards the strategic location. As expected a large crowd was already waiting there. From this vantage point one could clearly see the electronic display boards on at least three platforms, all of which were almost equidistant. I kept waiting patiently, but as the departure time of my Medinipur local was coming close, I felt a bit nervous. Am I waiting at the right place? Maybe things have changed over the years? Maybe the local trains all have their designated platforms. On my way to this spot I had even checked with the enquiry booth, but the guy behind the glass window had no answer for me. A young man was standing next to me watching vaguely at the display boards with a kind of dispassionate look. He must be a regular commuter, I thought. So I asked him, “Are you also waiting for the Medinipur Local?” He nodded affirmatively. I felt a bit relieved. As I waited, the loud speakers kept on announcing arrivals and departures of all kinds of trains, express, local, passenger, duranto, shatabdi etc. etc. Suddenly I heard the guy next to me muttering to himself. I soon realized he was just thinking aloud while trying to predict the potential platform where our train might arrive, “Well platform 13 is taken… they said Ranchi Express is coming on 12… Amta local on 14… hmmm… If they put it in 17 or 18 then God save us..” I was trying to figure out what he is talking about? Platform 17, 18? Where are they? He pointed to the left, “The new station…” What? My understanding was that the new Howrah station was supposed to be only for long distance trains of the South Eastern Railway section. How can they allocate those platforms to local trains? If such a thing happens, how are we supposed to go to that station? Isn’t it in a separate building? While I was thinking all this, the loud speakers blurted out, “Medinipur local to depart from platform number 17….” The guy next to me grinned which only meant, “See, I said so!” By then the huge mass of people have started to move to the left. This was something completely new to me. So I thought it would be best to follow the crowd and hence joined the mass movement. The huge mass gradually funneled into two (2) escalators which carried them to a four story high overbridge. The crowd moved in a single streamline motion and then poured down onto the platform number 17 just as our Medinipur local rolled in. I managed to plant myself on the platform along with the crowd as the train stopped right in front of us. Immediately the crowd divided itself into multiple groups with each group in front of a door as the passengers on the train started to pour out through the doors like flood waters through a broken dam. I couldn’t figure out what was the reason for their rush, but I soon understood. As the seemingly endless stream of disembarking passengers started to trickle down, the upstream frenzy began. And as the passengers started to storm in through the wide doors, one poor young man, who delayed his disembarking process due to some unknown reason, was raised off his feet and taken back inside the compartment by the incoming tsunami along with a barrage of insults (from both sides). By this time my adrenalin pumps are in full throttle and I turned my biological clock back by 25 years. I joined the melee and kicked and elbowed my way into the compartment and quickly lodged myself on to the first empty seat I found in front of me. Oh, what a feeling of accomplishment! It was as if I have won a war to get the most prized possession. Soon the compartment filled up. The unfortunate failures were all standing around us the winners, who although kept a stoic face outside, but inside we smiled smugly. And as the train blew its horn and rolled out of the station, I realized, some things haven’t changed a bit. I felt, I am home at last. 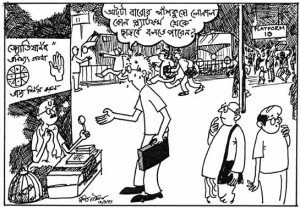 This entry was posted in Arts-Culture and tagged cartoon, commuter, Howrah, train by sudipta. Bookmark the permalink. “I am home at last”……………..Very true……….brought back my memories of my travels by local train to our “gramer baari”……………. I am so much impressed with your writing about day to day life in Bengal. Though much of our world has changed , we remain to be at the same state for years and possibly will remain so. With this we are very happy and proud.